Free electron lasers with attosecond capabilities, a high-energy electron accelerator less than a meter in length, the arrival of NERSC-6 and the departure of GELCO-4 were some of the highlights of Berkeley Lab Director Steve Chu’s State-of-the-Lab address, which he delivered at the Building 50 Auditorium during the noon hour on March 10, with simulcast to the Building 66 Auditorium. “The first thing I want to do is to thank you for all your hard work,” Chu told employees. Under our new contract, Berkeley Lab, like all other national laboratories, must undergo yearly evaluations, in which we are “graded” not only for science and technology, but also management and operations goals. After acknowledging individual and team awards and recognitions, and citing recent changes in scientific division leadership, Chu discussed the strong state of our scientific facilities. For example, research proposals at the Advanced Light Source (ALS) are at an all-time high; the Molecular Foundry’s project management team won the Secretary of Energy’s Excellence in Acquisition Award; and TEAM 0.5 debuted at the National Center for Electron Microscopy as the world’s highest resolution transmission electron microscope. Chu also noted that Lab funding for scientific programs has increased by 38 percent over the past six years and expects this trend to continue. Chu proceeded to describe the Advanced Photon Science Initiative, a multi-divisional effort aimed at developing a next generation light source with capabilities that exist nowhere else. Current plans call for a superconducting linac, housed in a tunnel stretching from south of the ALS to the former site of the Bevatron, that would feed 10 or more independently tunable free electron lasers. Other new Lab initiatives cited include multi-scale imaging for studying the structure and function of biological systems across dimensions and time; upgrades of the National Energy Research Scientific Computing Center that within the next 10 years should yield nearly 18-petaflop peak performances; the creation of a High Performance Buildings Research and Implemen-tation Center, (HiPerBRIC), aimed at curbing the energy demands of buildings in the United States; a laser-wakefield electron acceleration system that could reach 10 GeV in less than a meter; and a proposed Center for Integrated Earth System Modeling, which would address important climate change questions. A substantial portion of Chu’s address was devoted to Operations, starting with changes in leadership, including the retirement of David McGraw, Associate Laboratory Director for Operations. Chu also addressed the relocation back to the Hill of employees now in downtown Berkeley, the replacement of the GELCO travel system, and a deal to provide Lab scientists with the same access to journals as UC Berkeley faculty. Chu also told employees that over the next decade Berkeley Lab could receive more than $300 million for infrastructure improvements and new construction, including the Helios building, the ALS Guest House and User Support buildings, and the Computational Research and Theory Building. Daniel Chemla, a Berkeley Lab physicist who was recognized as one of the world’s foremost authorities on the optical and electronic properties of materials, and credited with saving the Advanced Light Source (ALS) and winning the Molecular Foundry project, passed away in his Kensington home on March 20. He was 67. In 1998, following a highly critical DOE review, Shank asked Chemla to assume leadership of the ALS. The rest is history. In addition to his acclaim as a scientist and scientific manager, Chemla was also renowned for his contributions to Shotokan Karate. He held the highest rank awarded in Shotokan Karate of America, founded France Shotokan, and was instrumental in starting karate training in Switzerland and Israel. No, it’s not your imagination, the View has slimmed down. It’s all part of a new Communications Department effort to reduce our carbon footprint. In the upcoming months, the View and several of our other publications will be undergoing a transformation as we move to provide news in a more integrated, efficient and environmentally friendly way. A fresh Berkeley Lab news site will soon be unveiled, with interactive features, video, podcasts and web feeds. The new site will come on line in late spring. Look to Today at Berkeley Lab for updates. The project management team behind the design and construction of Berkeley Lab’s Molecular Foundry has won the prestigious “Secretary of Energy’s Excellence in Acquisition Award,” given by the Department of Energy (DOE) for demonstrating “exceptional results in completing a project within cost and schedule.” Last October, this same team was recognized when the Molecular Foundry won a U.S. Green Building Council Leadership in Energy and Environmental Design (LEED) gold certification, the first LEED gold certification ever awarded to a building in the City of Berkeley. 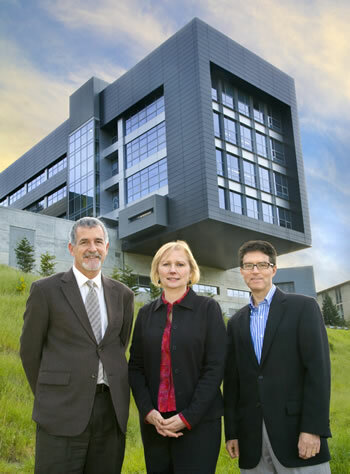 From left to right, Joe Harkins, Kathy Johnescu, and Jim Krupnick. “Winning this award helps gain DOE’s trust and confidence in the Lab’s ability to manage big projects like this and that can make the difference between winning and losing future projects,” said the Facilities Division’s Joe Harkins, project manager for the Molecular Foundry. He and Project Director Jim Krupnick, with the Directorate, accepted the award from Energy Secretary Samuel Bodman on Tuesday, March 18, at the annual DOE Project Management Workshop in Washington, D.C.
Also in Washington to accept the award were Altaf “Tof” Carim, program manager for DOE’s Office of Basic Energy Sciences, which oversees the Molecular Foundry, along with DOE’s other Nanoscale Science Research Centers, and Kathy Johnescu, of DOE’s Berkeley Site Office, who served as the federal project manager. Jim Bustillo, former associate director at the Molecular Foundry, another member of the project management team, did not attend the award ceremony. The Foundry is a six-story, 94,500 square-foot steel and glass building, constructed at a cost of $85 million. It was designed by the SmithGroup of San Francisco, and constructed by Rudolph and Sletten General Contractors, in close collaboration with the award-winning project management team. Ground was broken on Jan. 30, 2004, and the facility was dedicated on March 24, 2006. The Secretary’s Excellence in Acquisition Award is given to an individual or team that implemented ideas, methods or processes that led to measurable improvements in acquisition management. The LOASIS group led by Wim Leemans, of Berkeley Lab’s Accelerator and Fusion Research Division (AFRD), holds the world record for laser-wakefield acceleration, having accelerated high-quality electron beams to energies exceeding 1 GeV, a billion electron volts, in a distance of just three centimeters. That’s an accelerating gradient a thousand times greater than some of the most advanced conventional accelerators on the drawing boards. Now Leemans and his colleagues are poised to achieve energies an order of magnitude higher still, with BELLA, the BErkeley Lab Laser Accelerator. A hundred or so of BELLA’s 10-GeV modules strung together could create intense colliding beams of electrons and positrons with center-of-mass energies of a trillion electron volts in just a few hundred meters. That’s twice the energy of the proposed International Linear Collider, 30 kilometers long using conventional technology, in about the dimensions of a typical sports arena. For example, in a vacuum, electron-positron pairs are always blinking into and out of existence as virtual particles. An electric field strong enough to exceed the Schwinger limit (30 quintillion volts per meter) could “boil” or “snap” the vacuum, creating stable particles from nothing. Such fields could be produced by bouncing a petawatt (quadrillion watt) laser beam off a 10-GeV electron beam accelerated by BELLA. This kind of power could create conditions like those inside an exploding star; cosmology would come into the laboratory. Laser-wakefield acceleration begins with a plasma — a state of matter in which positively and negatively charged particles like protons and electrons are dissociated. A laser pulse driven through the plasma creates a wake that traps some of the free electrons and carries them along like surfers riding a wave. The LOASIS Program staff as of November, 2007: (back row) Eric Esarey, Cameron Geddes, Donald Syversrud, Michael Bakeman, Nathan Ybarrolaza; (middle row) Ken Barat, Csaba Toth, Wim Leemans, Carl Schroeder, Estelle Cormier-Michel, Chen Lin, Dmitriy Panasenko, Martha Condon; (front row) Nicholas Matlis, Olivia Wong, Anthony Gonsalves, Kei Nakamura, and Han Lambriks. BELLA will involve collaborations with the Lab's Physics, Engineering, Advanced Light Source, and National Energy Research Scientific Computing Center Divisions, academic institutions, other DOE laboratories, and private industry. When the electrons outrun the wake, acceleration stops. For a longer ride the LOASIS group developed the method of drilling a long focusing channel through the plasma, thin at the center, dense at the walls, analogous to the optical fibers used for long-range communications. A laser wake in the channel can maintain its accelerating power far enough and long enough to generate multi-GeV electron beams. LOASIS created its record-breaking beams using a 40-terawatt (40 trillion watts, 40TW) laser and a three-centimeter capillary carved in a block of titanium sapphire crystal. The capillary was filled with hydrogen gas; the discharge of a 1-joule capacitor turned the gas to plasma and formed the focusing channel guide; an instant later the laser pulse accelerated free electron bunches through the channel. BELLA will extend the LOASIS capillary-discharge technology to create channels up to tens of centimeters in length. Modules will be staged so that the accelerated electron bunches from each stage are passed to the next for added acceleration, which entails rapid periodic plasma formation and laser-pulse injection into each stage. Also needed are diagnostic techniques and powerful computer simulations for fine-scale characterization and modeling of the beams. Initially, given Berkeley Lab’s substantial commitment to LOASIS, BELLA needs only modest funding for additional staff and equipment. In addition, sections of the HILAC and SuperHILAC accelerators in Building 71 (which houses the LOASIS laboratory) must be removed and the building seismically retrofitted. The Computational Research Division's Visualization Group worked with the LOASIS group to simulate this model of electrons undergoing laser wakefield acceleration. But achieving 10-GeV electrons will require the highest average power petawatt-class laser in the world, one with petawatt peak power, firing 40-joule pulses of 40 femtoseconds each (40 quadrillionths of a second), and rapidly building to fire again and again, once every second. SATB1 is a protein in the nucleus of some cells that reorganizes chromatin and promotes or represses gene expression. A featured research article in the March 13 Nature garnered media attention around the world by relating the identification of the protein SATB1 as a trigger and key diagnostic indicator of the most aggressive breast cancers. Terumi Kohwi-Shigematsu, Yoshinori Kohwi, and Hye-Jung Han of Berkeley Lab’s Life Sciences Division, with Jose Russo of the Fox Chase Cancer Center in Philadelphia, found that SATB1, a nuclear protein previously best known for its role in the development of the immune system’s T cells, plays a much more sinister role in breast cancer cells. In vitro tests with numerous cell lines, and in vivo tests in mice, confirmed that in breast tumors, SATB1 reprograms the genome to change the expression of hundreds of genes, promoting tumor growth and metastasis — a transformation that does not occur if SATB1 is not expressed in the cell. Accelerators of positive particles like positrons or protons have problems when clouds of negative electrons accumulate in the beam pipe. In Physical Review Letters John Byrd, Stefano De Santis, and Kiran Sonnad of AFRD report a method for using phase shifts in a microwave signal to measure the intensity of electrons clouds in long stretches of beam pipe. Trees depend on root fungi called mycorrhizae for their health and even survival. Researchers at DOE’s Joint Genome Institute, France’s National Institute for Agricultural Research, and 14 other collaborating institutions have sequenced the fungus Laccaria bicolor as a first step in understanding how the tree-fungus symbiotic relationship can aid ecological balance, clean up contaminants, store carbon, and generate biomass. Hard drives and other modern electronics are built like Dagwood sandwiches, their performance depending on relationships between multiple layers. At the ALS Chuck Fadley of Materials Sciences has pioneered “swedge” — a method combining a standing wave and a wedge-shaped layer — to penetrate the surface of such materials and study their chemical compositions, magnetic properties, and precise electronic structures.